Plants are continuously challenged by different pathogenic agents in their environment. Viruses are among most important plant pathogens, significantly influencing fitness of the plants both in natural ecosystems and agricultural landscapes. As sessile organisms, plants need to quickly and efficiently respond to such challenges. Thus, plant immune response comprise a network of response mechanisms, which include perception of the attack, signaling and changes in plant physiology in which RNA silencing and transcriptome reprogramming have a crucial role. Some of the changes triggered by the infection of the virus were shown to persist also after the virus is not anymore present in the plant and could be inherited in the progeny of the infected plants, enabling quicker or a stronger response of the plant at the reoccurring stress caused by the same virus or other stressors. Epigenetic imprinting, in the form of host genome methylation/demethylation and histone modifications, has been demonstrated to be involved in this phenomenon. Often, plants are infected with several viruses at the same time or with different viruses in subsequent manner. Mixed infections of plant viruses (present in the plant at the same time point) have been a focus of several studies, which elucidated some of the mechanisms of the interactions observed between viruses in mixed infection. On the other hand, the indirect interactions between viruses, which are not present in the plant at the same time point, have not been addressed in detail so far. 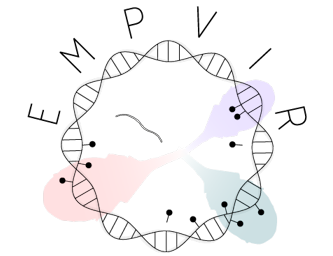 Since the changes in plant immune response caused by a past viral infection were shown to be persistent and even heritable, we hypothesize they will affect the response of the plant to subsequent viral infection with another virus (be it in the same plant or in its progeny) and such a changed response will be connected to the changes in the epigenome of the plants. To test this hypothesis we will set up an experimental system comprised of Arabidopsis thaliana, turnip mosaic virus (TuMV) and several other plant virus species. We will employ integrative biology approach, including several state-of-the-art high-throughput sequencing techniques to investigate the epigenome and transcriptome of the plants and the changes in virus population structures. (1) In the first part of the project, we will use several different plant viruses to prime the A. thaliana plants (transient infection with the virus) and subsequently determined the changes in the epigenome of the primed plants and their progeny. (2) In the second part of the project we will test if the priming with any of the viruses used in the first stage affects the response (by determining the changes in transcriptome of the plants and virus fitness in the plants) of the primed plants (or their progeny) to the infection with the second virus (TuMV). (3) Finally, we will also investigate if the changed response of the plants to the infection with the virus affects the evolutionary trajectories of the virus by following and comparing the dynamics of virus populations during the virus experimental evolution in primed and naïve plants. The outputs of the project will provide new knowledge about the plant immune response and interactions between viruses, which are not present in the plant at the same time. The results of the project will especially elucidate epigenetic processes involved in the studied phenomena. Increased understanding of these processes will not impact only the understanding of basic plant biology and plant virus epidemiology, but could also be exploited in plant biotechnology, where new, epigenetics-based crop improvement approaches show promising outlooks.